Senator Alfonse M. D'Amato and the former mayor of New York City, Rudolph W. Giuliani, are on the U.S. National Advisory Board of an organization that is closely tied to Israeli military intelligence, the America-Israel Friendship League (AIFL). The President & Chairman of the U.S. Board of this organization is Kenneth J. Bialkin. "The AIFL is the only non-sectarian national organization that promotes the relationship between the people of the U.S. and the people of Israel on a grassroots level," Bialkin says on AIFL's website. The other members of the U.S. National Advisory Board of AIFL are: Sen. Max Baucus, John Brademas, Kenneth Duberstein, Lawrence Eagleburger, Rep. Benjamin A. Gilman, William H. Gray, III, Vernon Jordan, Henry Kissinger, George P. Shultz, and Elie Wiesel. The AIFL describes its mission as "Building friendship based on common values." The America-Israel Friendship League describes itself as "a non-sectarian, non-political, not-for-profit organization strengthening ties between the people of the United States and Israel." The Israeli deputy chairman is a man named Rothschild: Major General Danny Rothschild, a former head of Israeli military intelligence and coordinator of government activities in the occupied territories. Rothschild, who owns and runs an Israeli-based security company called Netacs (Security) Ltd., was the former head of the Israeli military's intelligence research branch. Netacs does something called "Airport Risk Analysis and implementation projects" at 9 major airports in the United States, according to its website. Americans beware. Mr. Rothschild served most of his military service in the intelligence corps. Notable positions were Assistant to the Chief Of Staff of Israeli Defense Forces, Commander of S. Lebanon, Deputy Director of Military Intelligence & Chief of Intelligence Research and Analysis. Mr. Zohar served most of his tenure in the Intelligence Corps. Notable position: Head of Anti-terror Research and Operation. Mr. Ettinger served in elite combat units in field & command positions. Later served in the Intelligence Corps. Kenneth J. Bialkin is a partner in the law firm of Skadden Arps. Among other positions, besides being the chair of AIFL since 1996, Bialkin is or was the chairman of the Anti-Defamation League of B’nai B’rith (1982-1986), the Conference of Presidents of Major American Jewish Organizations (1984-1986), the American Jewish Historical Society (2003-Present), and is the president of the American Jewish Historical Society (1998-Present). "As leader of the most powerful Jewish organizations in the world, Bialkin has fought and presented Israel's case to American presidents, world leaders, to the media, to American Jewry and to Muslims," Lifestyles wrote about Bialkin in May 2004. "He is friends with Israeli and American politicians and with Israeli prime ministers who often ask for his advice." Bialkin says that he has signed on to pursue his Jewish identity because he believes in it, he is proud of it and because he is forced to. "If there were no antisemitism and no attacks against us and Israel, if we were not singled out maybe I'd be an assimilationist," he says. "But forces have made me conscious of my responsibilities. We are an honorable people with honorable traditions. We have a right to seek our betterment. Anyone who gets in my way is depriving me of something to which I'm entitled to…If I'm a laborer in the vineyard of Jewish liberation, it is because the enemy has forced me to do that." Bialkin is a partner in a law firm with the "special mediator" of the 9-11 litigation. There are currently fewer than 2 dozen cases left to be settled. If the cases are all settled in out-of-court settlements there will be no cases to try. This would mean that the 9-11 catastrophe would never be examined in an open and public trial on behalf of any of the victims or their relatives. In many of the wrongful death cases, such as that of Mrs. Mariani, the first 9-11 lawsuit, the plaintiffs rejected the compensation fund provided by the U.S. government in the hope that they would obtain truth and justice through the courts. "Why aren't you settling your cases?" Hellerstein asked Donald A. Migliori, attorney for plaintiffs with the law firm Motley Rice. "You're not working hard enough," Hellerstein said. "Ms. Birnbaum [special mediator] tells me she is getting no response from you." Sheila Birnbaum is the court-appointed special mediator who is a lawyer from the law firm of Skadden Arps, which is a firm with very close ties to the state of Israel and insurance companies. One of the partners of Skadden Arps is Kenneth Bialkin, a former national chairman of the Anti-Defamation League (ADL) of B'nai Brith, a key Zionist organization. Bialkin is also a director or former director of some of the key insurance companies involved in 9-11 litigation. Senator D'Amato was involved in a criminal bribery scandal with his brother and an executive of Unisys in the late 1980s. The system that a Unisys executive named Charles Gardner was paying D'Amato's brother to influence the senator to buy is part of the Aegis system. Gardner had been involved with the Aegis components produced in Great Neck, New York. "Unisys, a supplier to the Pentagon of computer-information systems, obtained the Aegis contract, valued at about $100 million, from the Navy in April 1988." Great Neck is a very Jewish area, which some Jews call a "shtetl." Shalom Yoran, the former head of Israel Aircraft Industry and founder of the Israeli Air Force, 1948-1954, lives in Great Neck. He was president of the Bedek Division, which oversees Israeli military aviation, when he retired at age 50 and came to Great Neck in September 1979. 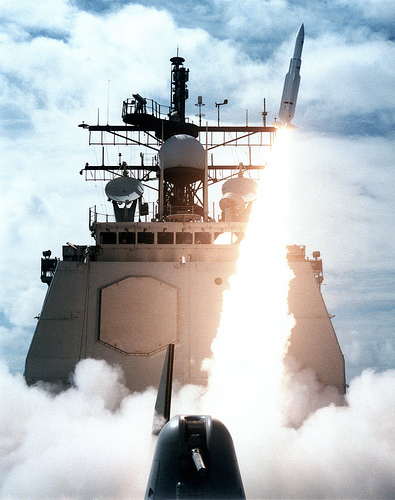 The Aegis system was involved in the shooting down of the Iranian airliner. On 3 July 1988, Vincennes, under the command of Captain William C. Rogers III, shot down an Iran Air Airbus A300B2 over the Strait of Hormuz, killing all 290 aboard. Is it just a coincidence that the former president of Israel Aircraft Industry and Aegis come from the same small town on Long Island? Perhaps - but it is a coincidence worth investigating.